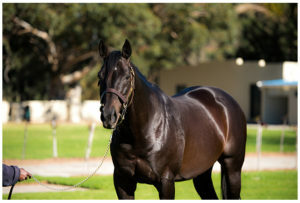 Ridgemont Highlands’ four times Equus Outstanding Stallion Dynasty was at it again at Kenilworth on Wednesday, when the former Horse Of The Year was responsible for two eye catching winners (from only three Dynasty sired runners on the day). Both of Dynasty’s winners on Wednesday were two exceptionally well bred 3yo fillies –both of whom look to have bright futures ahead of them. The Ridgemont Highlands bred Front And Centre made it three wins from three outings when destroying some useful older opponents in a fillies and mares handicap over 1400m on Wednesday. Ridden by Anton Marcus, who was able to take a look over his shoulder in the closing stages, the Brett Crawford trained filly won as she liked –with Front And Centre placing an emphatic three and a half lengths between herself and older runner up Strawberry Fire. The regally bred Front And Centre now looks a leading contender for next month’s G1 Cape Fillies Guineas –a race won by Dynasty’s champion daughter Just Sensual in 2016. 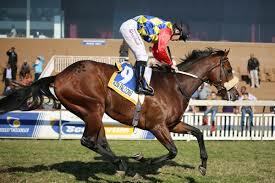 Another Dynasty 3yo daughter to score on Wednesday was the Drakenstein Stud bred and owned Madonna. Placed at both of her two previous outings, the lightly raced filly stormed home to shed her maiden by 1.5 lengths over 1400m for champion trainer Justin Snaith and in-form jockey Richard Fourie. Dynasty will be represented in Saturday’s R2.5 million CTS Ready To Run Stakes by Majestic Mozart, while another son, Thanksgiving, lines up in the same day’s G2 Dingaans and Dynasty daughter Storm Destiny is a contender for Saturday’s G3 Fillies Mile at Turffontein. The sire of champions Futura, Irish Flame, Legislate, It’s My Turn, Just Sensual, Beach Beauty, Bela-Bela and Lady In Black, Dynasty has a single lot on Friday’s CTS Ready To Run Sale.